"I'd like Winter if it had more days like this." Those are the words my husband sighed as he closed his eyes and lifted his head toward the sunshine. Despite dwelling deep within Winter's embrace we have been blessed this week with enough intervals of sun-drenched blue-bird skies to forgive the stretches of pewter-cloud rainfalls. There is something about an unexpected sunny day that makes you cherish it that little bit more. It lifts your spirits and bestows a much needed energy refill allowing you to accomplish what you wish with a spring in your step. I was not the only one who threw open doors and banished the slumbering dust from their home today, but I was perhaps the only one who was luckily enough to taste these lovely pancakes this morning, fit for a day like today. In a large bowl, combine the flour, sugar, baking powder, baking soda, lemon zest and salt. Add the egg and buttermilk. Heat a nonstick pan over medium heat with a little butter. Add 1/3 cup of batter to the pan and cook a few minutes on both sides, until just lightly golden brown. Meanwhile, combine blackberries, sugar, lemon juice and water in a small saucepan and bring to a simmer over medium heat, cook until syrup reduces to desired consistency. Syrup will thicken upon cooling. cooking time: 15mins to make all pancakes. taste: 4/5. Sunshine for your tastebuds. The fluffy citron-hued pancakes filled with the summery sharpness of lemons pair beautifully alongside the wine-coloured blackberries bursting with rubicund berry sweetness. I'm not sure if you got this from my site or not (the link didn't work for me) but I made something just like this recently and I. am. obsessed. :) I am glad someone else loves it as much as I do - and I'm glad you made the syrup with real blackberries! Yum! So scrumptious! That combination of flavors is just irresistible. i really have a thing for lemons at the moment. 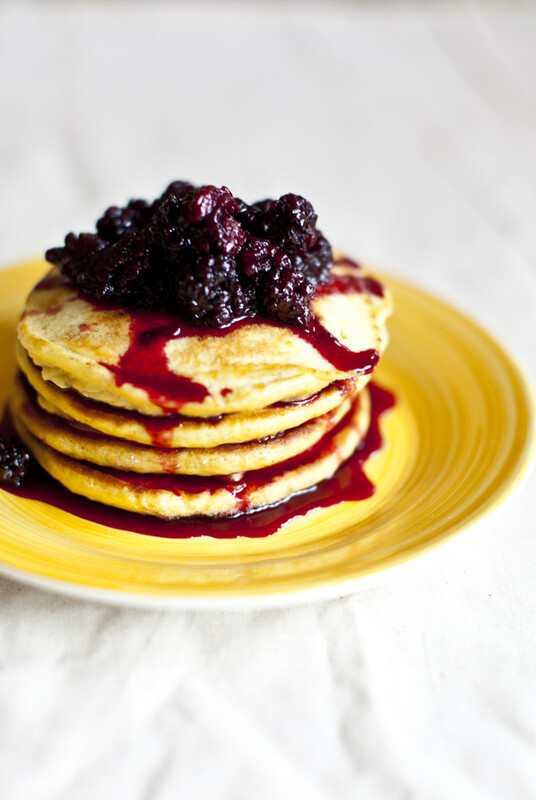 Berries and lemon pancakes sound like heaven on a plate for me right now! I agree with Xiaolu you have such a poetic writing style! Love it. And those pancakes look amazing. You just had me craving for pancakes like crazy! Great minds think alike! Or maybe it's just the season. But I've been making these a lot lately. Such a lovely and bright flavor combination! I'm hungry for breakfast and these just look incredible right now! Wish I had some in front of me. You're right, you do cherish unexpected sunny days that much more, and your pancakes look like the perfect way to celebrate. I love anything with lemon! For some reason, I got excited and read that as lemongrass pancakes.. hahahaha... you would be proud of me.. I have a persimmon recipe! NO MEAT! Yayy! although we've plenty of sunshine these days, i can always enjoy a zing from lemon-flavored goodies. lovely display! How lovely. These look utterly divine. I will certainly make them - hopefully v soon! I am drooling at my screen right now! We saw you on food gawker and we just started following you! Cant wait for more treats! This looks beautiful!!!! I'm gonna try these soon.